Up early, HF radio sked; I did a few exercises, made breakfast, computer time, wash-up, clean-up, got ready to go in the tinny up Casuarina Creek. MrJ and I decided to wait till after the tide had turned from low to beginning to come in before taking our little adventure tour up the Casuarina Falls in our new second hand now fitted out for a joy-ride tinny. Instead of a morning tea/coffee I had made an early lunch to eat before we set off. In small containers and bags I had pre-packed a water bottle, cheese and biscuits, repellent, sunscreen, cameras, walking shoes and socks, torch, handheld VHF and then seal everything in our big orange wet-bag. MrJ had already put in the tinny our old reef walking shoes, several empty water jerry bottles, the heavy old fuel tank which was fitted to the outboard, the wooden oars and extra pieces of long line rope for tying off to trees or rocks with and a long line with small anchor attached. We were wearing light shorts, long sleeved sun shirts and wide brimmed floppy hats. We did forget to pack a GPG; give us something to remember for the next trip. Oh, how exciting that we were to being heading out on an adventure! Getting into and out of the tinny was not the most exciting part of the adventure! To get in or out of the tinny, it was most important to step as close to the centre of the boat as possible to prevent the boat from tipping sideways; bit different to my dear little rubber duckie which to step anywhere is not an offence with its nearly flat bottom. Stepping onto the seats of the tinny made me feel like I was not in balance and all I could see was me going overboard. To step in the centre of the hull or at least to try to step in the bottom of the boat meant navigating all the gear that had been stowed around and where I was supposed to be sitting, according to the skipper, my foot space was taken up by the petrol tank. I just had to tread where I could and with every little sideways movement of the boat I would flinch and stiffing; not being able to get comfortable which probably made the ride less pleasant. During the ride up the creek I shuffled a few things around, pushed the fuel tank up further till I was happy with the foot space and could keep balance on my seat and began to enjoy the ride. 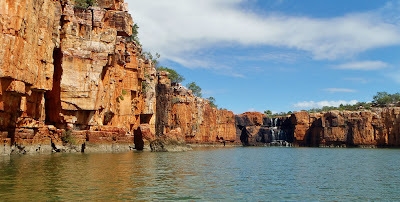 1n/mile up Casuarina Creek, the creek ends in a circular pool, a large amphitheatre of red rock wall with a high water fall cascading a small amount of water some 50mts below into the creek. 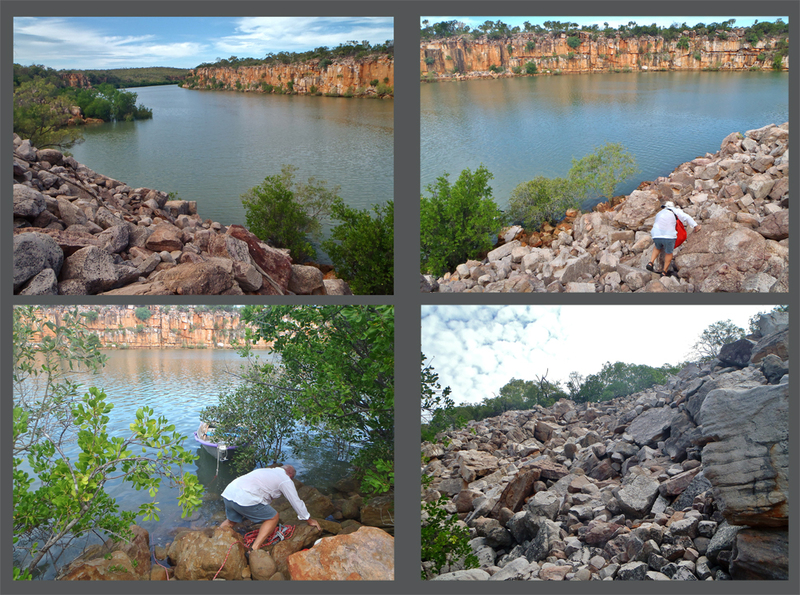 There was a small rocky mangrove covered island in the centre of the water pool not too far out from the waterfall. 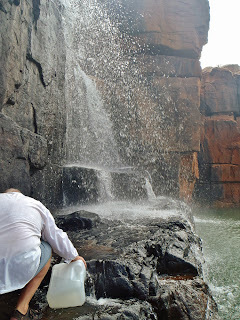 I could see the dark marking on other parts of the rock wall which indicated that in a good wet season with loads of rain that there were many other waterfalls to be had. Not so much this year; the wet season had been so little and now at the beginning of the dry season there was not much water at all. 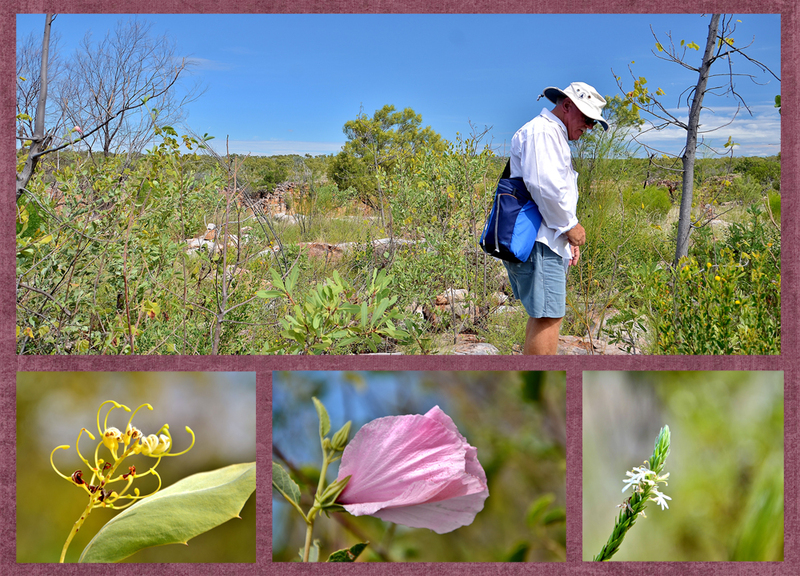 Makes me think – what will it be like at the end of the dry season? No water at all? MrJ and I motor up to the rock ledge at the bottom of the falling stream of water. The tide is still too low to allow us to climb up on the ledge but we can see that with a little bit more water it would be easy to do and to fill our bottle with the fresh water. Deciding to return we motor off toward the big rock Scree on the north side to try and find the way to the top of the red cliffs. A rock Scree is where part of the rock wall has fallen away leaving a huge pile of large and small rocks forming a giant step-up to the top of the cliff from adjacent cliff faces. Official definition - scree is a collection of broken rock fragments at the base of crags, mountain cliffs, volcanoes or valley shoulders that has accumulated through periodic rock falls. The term Scree comes from the Old Norse term for landslide (skriða). And you climb up this anyway you can, carrying your supplies on your back, without falling or getting your foot stuck in a hole or between the rocks. I volunteered to pack the big bag on the way up leaving MrJ to secure the anchor line a quarter of the way up the screen. It was all hard going like an old nanny goat, on hands and feet. I was sure that I would not be carrying the bag on the way down. I can do going up much better than I can do coming down! 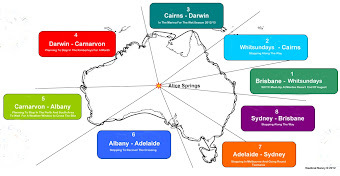 Boy, I was so glad that while in Darwin I kept my fitness up to some sort of level. As I climbed I was thinking of Barbara and Ron Chester in their early days, with paying tourists, lugging all the gear up these rocks, movie camera gear and all. It was a couple of years ago that Ron had a bit of a fall on these same rocks while bringing gear down; he was so damn luck not to have been killed. MrJ and I then had to fight the tree line to get over the top where we could set up a base camp to leave the bulk of the gear right beside one of the rock cairns that had been place by people before. There were heaps more of these rock cairns to show the way across the rock and scrub terrain. At first for a short distance, MrJ and I, MrJ in front leading the way, had followed the cairns that were heading away from the cliff edge until we stopped, took a look around. I was listening for the sound of the waterfall which was in the other direction. We took off across the rocky ground towards the sound of the water till we came to the cliff edge again and some more rock cairn were now visible. Later after checking on the mud maps and guides back on the boat I believed that the first cairn track that we took off on would have led us toward the track that takes you to where there were some Bradshaw rock drawings further up the creek, maybe another 2n/m on foot. As much as I would have liked to have seen these drawings I’m afraid that my ankles would not stand the walk, or scramble that far and be sure to make it back. In this rough rugged desolated country it was always a pleasure to find the most delicate of things; wildflowers of pale yellow or white or pale pink, the fine almost like rough hair, bark on some trees. How these wonderful things can survive in these harsh places is the magic of the natural world. MrJ and I keep clambering across the rocky terrain till we come close to where the water falls over the edge of the cliff to the creek below. 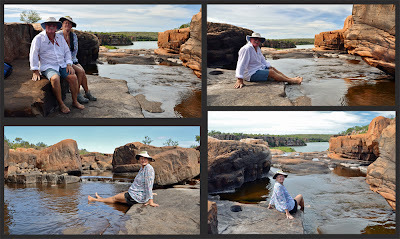 It was not such a hard climb down to the cooling rock pools at the top of the water fall where we take off our shoes, stick our feet in the water and splash ourselves with the cooling water. We take cupped handfuls of fresh sweet water, to drink, from the smaller cascading streams, wetting our dry throats; we take some time out to rest and enjoy the splendour of our surrounds before having to head back to the tinny. I was right, for me, the climbing down was harder that the going up! Once back safely in the tinny, MrJ and I motor back to the bottom of the waterfall whose bottom ledge was now at boat level and easy to climb onto. Here we drank from the waterfall, washed the sweat off our faces again and filled our water bottles. Having the knowledge that there was a good supply of fresh water to be had was a great relief. MrJ and I take our precious load back to AR feeling very positive about moving further up the river. The anchor came up and we slowly motored up stream for another 7n/m to watch the red rock cliffs get taller and the passage between them narrow as the Berkeley River wound its way through the earth. What a majestic sight! Rock stacked upon rock, millions of them 100mt high it is written in the guide book. I suppose the only experience that I have ever had that would come anywhere close to this would be the time, several years ago when MrJ and I went on a tour up Katherine Gorge in a small boat. 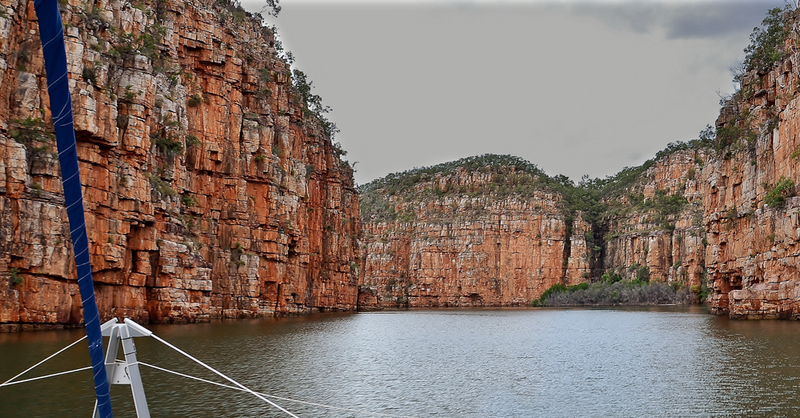 I would say that these, the Berkeley’s high cliff faces would be as high if not higher in some places than Katherine and most certainly much narrower with relatively deep water all the way through. Somewhere up through this red gorge we pass another boat coming downstream; an old boat with just as old looking fella that had a light or greying beard almost to his waist at the helm. They both sure did look like something form years gone by; a lone-sailor no doubt, out here enjoying the last of a free world, similar to us. (14'28.957S - 127'40.284E), the dark blackened rock wall looked damp but the falls were not flowing; more signs of a poor wet season.